Green Exchange is the country's largest commercial real estate development designed for the advancement of green business. The project began as a mission to move the green marketplace from niche to mainstream and has succeeded by bringing together an opportune mix of exceptional organizations under one roof. The result is a dynamic environment that fosters connections and provides constant opportunities for green businesses to grow. The four-story, 272,000 square foot building was converted in accordance with Leadership in Energy and Environmental Design (LEED), and has received the highest level of certification from the U.S. Green Building Council. 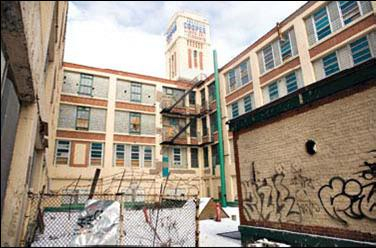 Originally constructed in 1912 as a warehouse for the Vassar Underwear Company, the building was last used by the Cooper Lamp Company as a factory. When we acquired the building in 2006, it was vacant and dilapidated, requiring a complete renovation. By working with the Commission on Chicago Landmarks and the National Park Service, we were able to obtain landmark protection for this historic building and have maintained 96% of the original structure throughout renovations. We have successfully transformed the existing building into a Class A, eco-friendly property that is an epicenter for green businesses and organizations in the Midwest. 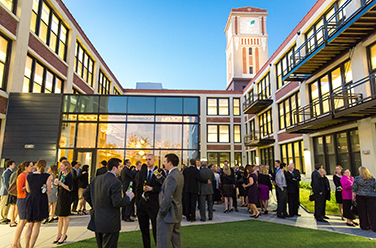 The rehabilitated building provides significant retail presence, with showroom galleries, office space, incubator lofts and attractive common areas. In 2011, tenants began moving in, and today occupancy is at 94%. The property is anchored by Coyote Logistics, voted the #1 place to work in Chicago, and one of the coolest office spaces in Chicago. As America’s largest green business community, the campus houses over 20 businesses and 1,200 people. Features include a sky garden, an on-site restaurant, an expansive meeting and event space, five rooftop beehives, and an adjacent urban farm. The property is located directly adjacent to Interstate 90/94, visible to more than 2,000,000 people each week, and serves as an icon of green development and sustainability for the City of Chicago. Green Exchange features indoor and outdoor event spaces that can be booked for anything from corporate training, meetings, to weddings and parties.